The 2019 Venezuelan protests are a collection of protests that have been organised, since 11 January, as a coordinated effort to remove Nicolás Maduro from the presidency. Demonstrations began following Maduro's controversial second inauguration, developing into a presidential crisis between Maduro and National Assembly president Juan Guaidó. The protests also include counter-demonstrations organised by those who support Maduro and have taken to the street to support him. Protesters gathered in Caracas on 23 January. Juan Guaidó beside supporters during the first open cabildo. Protesters in Caracas during the second inauguration of Nicolás Maduro. The Wall Street Journal reported in a March 2019 article entitled "Maduro loses grip on Venezuela's poor, a vital source of his power" that slums are turning against Maduro and that "many blame government brutality for the shift". Foro Penal said that 50 people—mostly in slums—had been killed by security forces in only the first two months of the year, and 653 had been arrested for protesting or speaking against the government. Many Venezuelans did not support the inauguration of Maduro, and held protests across the nation and in the capital city, Caracas. Several cacerolazos were reported across Caracas, including near to where Maduro was being sworn-in. Maduro supporters demonstrated separately. Before the inauguration, the opposition had called on the people to protest during the inauguration, with one protest co-hosted by students led by Rafaela Requesens and Guaidó's Popular Will party, blocking off a road near UCV. Treated as a form of peaceful protest, several open cabildos were held in January 2019. The first of these was on 11 January, held by Guaidó. In the streets of Caracas people gathered to support him. In anticipation of the protests on 23 January, other violent protests occurred. On 21 January there was a small-scale attempted military mutiny seen as a failed coup. There were 27 soldiers who kidnapped security and stole weapons, trying to march on Miraflores, who fought with and were apprehended by authorities in the early hours. People in the local area continued the fight, protesting and burning things in the street even as tear gas was deployed. Colectivos killed a non-protesting woman in her own doorway, and five others were injured. On 22 January protests broke out in working-class Caracas neighborhoods, which until then had supported Maduro. These resulted in the death of a 16-year-old boy by gunshot. Other protests happened in the large Bolívar state, where three people were killed and a statue of Hugo Chávez set alight and broken in half before the head and torso were hung like a trophy from a public bridge. Announced at the 11 January open cabildo, a series of protest marches drawing crowds which were reported by The Economist, The Wall Street Journal editorial board, and Yeshiva World News from hundreds of thousands to millions of Venezuelans, 23 January protests – on the anniversary of the 1958 Venezuelan coup d'état that overthrew dictator Marcos Pérez Jiménez – were the flagship event hoping to force Maduro to step down. United States Vice President Mike Pence sent a video of support to the nation on this day. Similarly, Juan Guaidó and his wife Fabiana Rosales sent separate videos to the military of Venezuela, asking for them to "not shoot at us". Cofavic interviewed witnesses who said that special forces killed five youths who had attended protests supporting the opposition. During the evening hours, President of the Constituent Assembly Diosdado Cabello called on Maduro supporters to hold a vigil surrounding Miraflores Palace, though no one attended the event. The Redes Foundation denounced in the Colombian Public Ministry that armed groups made up of National Liberation Army members and FARC dissidents, supported by the Bolivarian National Police and FAES officials, killed two Venezuelans, Eduardo José Marrero and Luigi Ángel Guerrero, during a protest in the frontier city of San Cristóbal, on Táchira state. Other protesters were injured during the shooting. A few days later, Michelle Bachelet of the United Nations expressed concern that the violence during the protests could spiral out of control, and requested a UN investigation into the security forces' use of violence. On 2 February opposition demonstrations filled the Las Mercedes Avenue [es] in Caracas. The theme of the protests was to demand the entry of humanitarian aid into Venezuela, with hundreds of thousands of Venezuelans participating to show support for Guaidó. 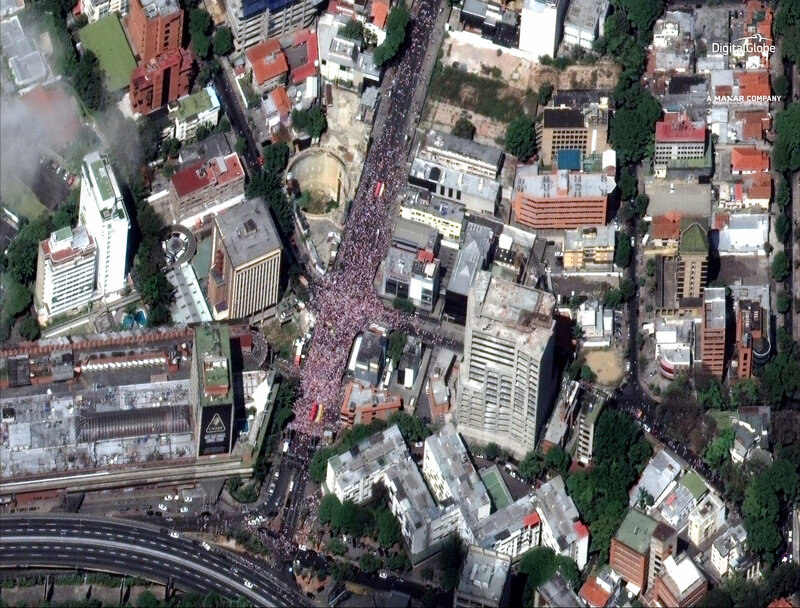 According to La Patilla, which provided satellite images, Maduro supporters participated in smaller counter-demonstrations on the same day at the same time. At least 285 were injured and 14 were killed in the clashes on 23 February 2019. Guaidó "took to the streets" to question Maduro's governance during the first two days of a nationwide blackout. According to The New York Times, "Maduro did not address the nation and his public silence has fed the tension gripping Caracas". Protests against Maduro in Caracas and other cities were called for 9 March, and went on despite the closure of the Caracas Metro and the lack of social media. The rally headed by Guaidó, took place near the presidential palace in Miraflores; The Washington Post labeled the manifestation as "unusual" as it was held in a sector usually associated with Maduro supporters. Heavy police presence blocked the streets with anti-riot shields. During the second wave of nationwide blackouts, Guaidó summoned new protests that would precede Operation Freedom (Spanish: Operación Libertad), a decisive massive rally through Caracas. According to Guaidó, the goal of the protests is to increase political pressure, but rehearsals are needed as the operation cannot be organized "from one day to the next”. Thousands of Venezuelans participated in a rally on 30 March, against the recurring blackouts. Guaidó toured around Miranda state and Caracas giving several speeches.Anti-riot police used tear gas against several opposition groups in areas where the Maduro supporters were active. Cacerolazos were reported in Caracas after blackouts resumed on Saturday night. The next day, protests against the lack of electricity and water occurred in Caracas and other cities. Some of the protests occurred close to the presidential palace. Maduro called again on the colectivos, asking them to “to defend the peace of every barrio, of every block”. Videos circulated on social media showing colectivos threatening protesters and shooting in the streets; two protestors were shot. On Sunday night, police fired at protesters after they set burning barricades. On 6 April, rallies were called by Juan Guaidó in more that 300 points around the country. Tens of thousands of Venezuelans denounced the lack of electricity and protested against Maduro regime, who they hold responsible for the economic crisis. Guaidó met the protesters at the main rally in El Marqués district of Caracas. In Maracaibo, the second largest city of Venezuela, protests were dispersed by police forces with tear gas and rubber bullets. El Nacional reported how tear gas was thrown from helicopters. Two lawmakers were also briefly detained in Maracaibo. In Venezuela, there were demonstrations in support of the Bolivarian Revolution, Maduro's government and against foreign intervention in Caracas, Carabobo, and Apure states. At the end of January, a rally in support of Maduro, called by Venezuelan oil workers, marched through the streets of Caracas. On 2 February, a counter-protest was held in the Bolivar Avenue, Caracas, in support of the Venezuelan government. The rally was held on the 20-year anniversary of Hugo Chávez’s first inauguration. On 10 February, thousands of Venezuelans queued to sign[unbalanced opinion?] an open letter denouncing "US-led foreign intervention". Journalist Javier Mayorca reported that the government prepared a campaign to "force police and military officers to sign the open letter". According to PROVEA, a group of police officers of the Mariño municipality of the Nueva Esparta state that refused to sign the document were arrested. Journalist Nitu Pérez Osuna [es] reported complaints that "hundreds" of employees of the public television channel TVes were fired for refusing to sign the letter. [better source needed] On 17 February, two National Guardsmen were detained for refusing to sign the book "Hands Off Venezuela" and expressing their agreement with the entrance of humanitarian aid. ^ a b "Denuncian que guerrillas colombianas causaron muerte a venezolanos durante manifestaciones contra Maduro". Infobae (in Spanish). 25 January 2019. Retrieved 28 January 2019. ^ a b c "Más de 285 heridos y 14 asesinatos por represión del régimen de Maduro este #23Feb, estima informe de la OEA". La Patilla (in Spanish). 23 February 2019. Retrieved 24 February 2019. ^ a b c d Luhnow, David (19 March 2019). "Maduro loses grip on Venezuela's poor, a vital source of his power". Wall Street Journal. Retrieved 20 March 2019. ^ Ariza, Alma (10 January 2019). "VIDEO | Venezolanos repudiaron la juramentación de Nicolás Maduro" (in Spanish). Retrieved 13 January 2019. ^ "acerolas sonaron en las inmediaciones del TSJ tras juramentación de Maduro [+Video]" (in Spanish). Versión Final. 10 January 2019. Retrieved 13 January 2019. ^ "Reportan cacerolazos en Caracas mientras Nicolás Maduro es juramentado" (in Spanish). Informe21. 10 January 2019. Retrieved 13 January 2019. ^ "Movimiento estudiantil protestó contra la juramentación de Maduro". El Nacional (in Spanish). Retrieved 10 January 2019. ^ "Juan Guaidó: Me apego a los artículos 333, 350 y 233 para lograr el cese de la usurpación y convocar elecciones libres con la unión del pueblo, FAN y comunidad internacional". Retrieved 11 January 2019. ^ "Venezuela 'foils national guard rebellion' against Maduro". BBC News. Retrieved 22 January 2019. ^ "Mujer fue asesinada en la puerta de su casa por un colectivo en Cotiza". El Nacional (in Spanish). 21 January 2019. Retrieved 22 January 2019. ^ a b "Dos muertos y cinco heridos dejan nuevas protestas contra gobierno de Maduro". El Caracol (in Spanish). Retrieved 23 January 2019. ^ "Venezuelans take to the streets again. Could democracy be won this time?". Washington Post. Retrieved 23 January 2019. ^ "Venezuela: la oposición informa sobre un joven muerto en las protestas contra Maduro". La Voz de Interior Argentina (in Spanish). Retrieved 23 January 2019. ^ "Four dead in clashes ahead of Venezuela protests: Police, NGO". Business Standard. Retrieved 23 January 2019. ^ "Opposition launches protests to oust Maduro as U.S.-Venezuela tensions rise". The Washington Post. Retrieved 23 January 2019. ^ a b "Venezuelans Heed Call to Hit the Streets With Maduro Under Pressure". www.bloomberg.com. Retrieved 23 January 2019. ^ "Revolt in Venezuela". Wall Street Journal. Retrieved 24 January 2019. Will this be the moment that Venezuelans finally reclaim their democracy? Millions dared to hope on Wednesday as they poured into the streets of Caracas and other cities to demand the resignation of dictator Nicolás Maduro in favor of the president of the National Assembly, 35-year-old Juan Guaidó. ^ "Trump Recognizes Opposition Leader as Venezuela's President as Millions Protest". Yeshiva World News. 23 January 2019. Retrieved 19 February 2019. ^ a b "Deaths as Venezuela protesters gather". 23 January 2019. Retrieved 23 January 2019. ^ Herrero, Ana Vanessa (23 January 2019). "Opposition Leader Declares Himself Venezuelaâ€™s President in Direct Challenge to Maduro". The New York Times. ISSN 0362-4331. Retrieved 23 January 2019. ^ "Militantes del PSUV dejaron solos a Maduro y a Cabello en la vigilia del Palacio de Miraflores". El Cooperante (in Spanish). 24 January 2019. Retrieved 24 January 2019. ^ Nadie asistió a la vigilia de Miraflores (+video). YouTube (in Spanish). Noticiero Digital. Retrieved 2 February 2019. ^ "Bachelet pide investigar muertes en protestas y plantea diálogo inmediato en Venezuela". Efecto Cocuyo (in Spanish). Retrieved 26 January 2019. ^ "Guaidó exhibe músculo en la calle con una multitudinaria manifestación en Caracas". Europapress (in Spanish). 2 February 2019. Retrieved 3 February 2019. ^ a b León, Ibis (2 February 2019). "Chavismo empieza a concentrarse en avenida Bolívar de Caracas este #2Feb" (in Spanish). Efecto Cocuyo. Retrieved 15 February 2019. 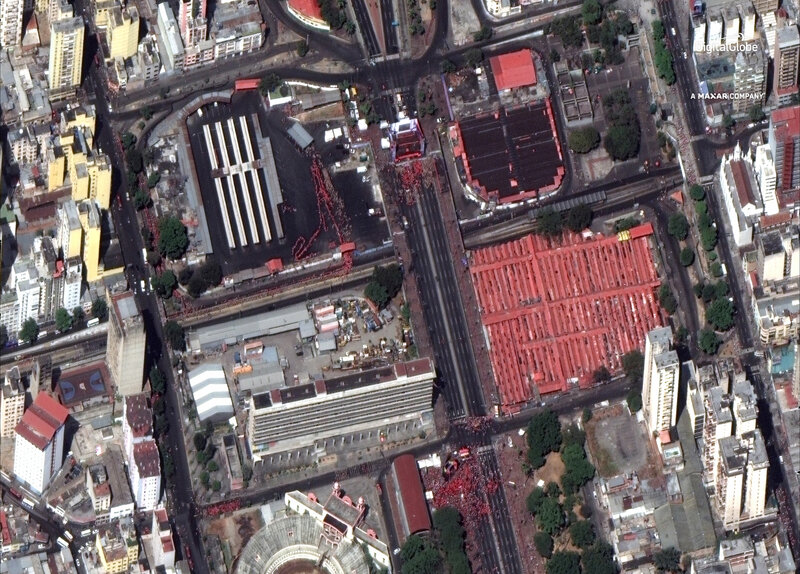 ^ a b "Estas contundentes FOTOS satelitales demuestran que la "marcha" de Maduro fue microscópica". La Patilla (in Spanish). 4 February 2019. Retrieved 19 February 2019. ^ "Venezuela blackout, in 2nd day, threatens food supplies and patient lives". New York Times. 8 March 2019. Retrieved 18 March 2019. ^ Sheridan, Mary Beth (9 March 2019). "Anti-Maduro demonstrators jam Venezuelan streets despite blackouts". The Washington Post. Retrieved 14 March 2019. ^ a b Phillips, Tom; Torres, Patricia (27 March 2019). "Venezuela: opposition leader promises final push against Maduro amid new blackout". The Guardian. ISSN 0261-3077. Retrieved 31 March 2019. ^ Deisy Buitrago; Shaylim Valderrama (31 March 2019). "Venezuelans rally to protest chronic power outages". Reuters. Retrieved 31 March 2019. ^ a b Jorge Rueda; Christopher Torchia (31 March 2019). "Venezuela's rival factions rally as power struggle persists". The Washington Post. Retrieved 31 March 2019. ^ "Vecinos de Caracas tocan cacerolas este sábado luego de apagón". El Nacional (in Spanish). 30 March 2019. Retrieved 31 March 2019. ^ a b Torchia, Christopher (1 April 2019). "Venezuela's Maduro announces power rationing amid outages". The Washington Post. Retrieved 1 April 2019. ^ Valderrama, Shaylim (1 April 2019). "Venezuela's Guaido pledges more protests over power, water shortages". Reuters. Retrieved 1 April 2019. ^ "Guaidó lidera "Operación Libertad" y señala que intervención militar es "prematura" según aliados". La República. 6 April 2019. Retrieved 7 April 2019. ^ a b c d e f g Vivian Sequera; Deisy Buitrago (6 April 2019). "Venezuelans rally to demand power, water and end to Maduro". Reuters. Retrieved 7 April 2019. ^ a b "Desde helicóptero lanzaron bombas lacrimógenas a manifestantes en Zulia". El Nacional (in Spanish). 6 April 2019. Retrieved 7 April 2019. ^ "Decenas de miles de venezolanos salen a la calle en apoyo a Nicolás Maduro" (in Spanish). EiTB. 23 January 2019. Retrieved 2 February 2019. ^ "Multitudinaria marcha en Caracas en apoyo de Maduro y en defensa de la petrolera estatal". RT. 31 January 2019. Retrieved 1 February 2019. ^ "Lacava: "¡Carabobo está con Nicolás!"" (in Spanish). El Carabobeño. 1 February 2019. Retrieved 2 February 2019. ^ "Las manifestaciones en apoyo a Nicolás Maduro en imágenes". Milenio. 1 February 2019. Retrieved 1 February 2019. ^ "Supporters of Venezuelan President Maduro March on Streets of Caracas (VIDEO)". Sputniknews. 31 January 2019. ^ Jorge Martin (5 February 2019). "Chavistas march against imperialism: what is the next step in Trump's coup?". ^ "How Venezuela Arrived At Its Political Crisis". NPR. 4 February 2019. ^ "Venezuelan Artists March to Commemorate Ali Primera, Reject Coup". Venezuelanalysis. 9 February 2019. ^ Elmaazi, Mohamed (11 February 2019). "Thousands of Venezuelans queue to sign open letter 'denouncing' Western-backed coup". The Canary. ^ "Obligarán a funcionarios militares a firmar en contra de la "intervención"". El Nacional (in Spanish). 10 January 2019. Retrieved 12 January 2019. ^ "Detienen a funcionarios de PoliMariño por negarse a firmar documento en rechazo a la ayuda humanitaria". La Patilla. 13 February 2019. Retrieved 15 February 2019. ^ "Denuncian despidos masivos en TVes por negarse a apoyar a Maduro (+Video)". Tenemos Noticias (in Spanish). 11 February 2019. Retrieved 12 February 2019. ^ "Dos GNB fueron detenidos por respaldar el ingreso de la ayuda humanitaria" (in Spanish). El Nacional. 18 February 2019. Retrieved 20 February 2019. Wikimedia Commons has media related to Demonstrations and protests in Venezuela in 2019.